Redevelopment. That is the reality in Vancouver as precious pockets of land and storefronts are transformed into multi-level housing. 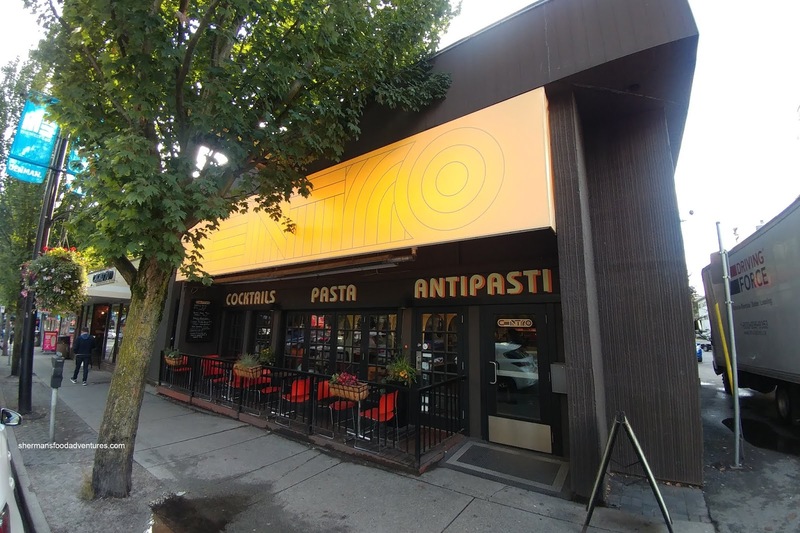 This led to the closing of Pronto on Cambie Street and the subsequent opening of Centro on Denman (until that also is redeveloped?). We recently visited the place for dinner with Elaine and Costanza. Upon entering, we were greeted with "Bino's-eque" 1970's decor that pays homage to the original building (where a Bank of BC used to reside). Since we didn't ask them to course out our food, things came fast and furious. 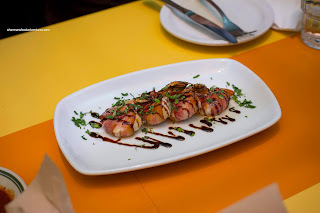 We had to dig into the Wild Boar Pancetta-Wrapped Prawns quickly due to lack of space on the table (they did add another one to give us more room though). These were baked and served with gremolata. Meaty while retaining a firm snap, the briny prawns were amped by the salty and cooked-down pancetta. I didn't notice much of the gremolata though. 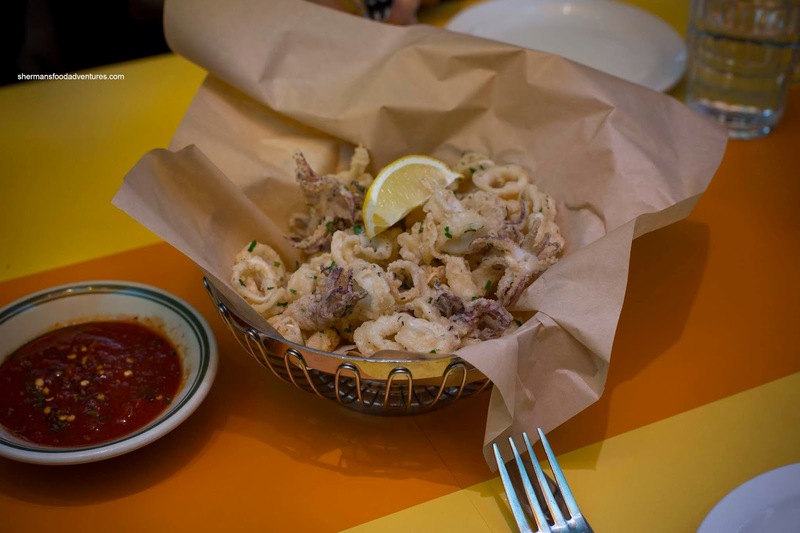 Served with spicy pomodoro, the Calamari Fitto was well-executed. Although the pieces were small, they were not dried out. There was an appealing chewiness underneath a razor-thin batter that was crispy and well-salted. The spicy sauce on the side really added a kick. 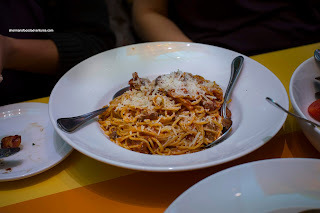 After that, a bunch of pastas arrived including the Spaghetti with mushrooms and veal cheek ragu. This was a substantial portion of al dente spaghetti with a generous amount of ingredients. Since it was piping hot and full of sauce, the longer it sat, the more soft the pasta got. I was fortunate enough to sample some right away and it was very "mushroomy" with only intermittent hits of tender veal. The sauce itself was quite mild and completely dominated by the mushrooms. I personally love the taste of mushrooms, but for others, it was not balanced. 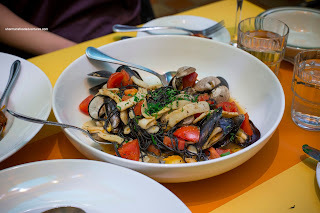 Another daily feature was the Capellini Nero with clams, mussels, calamari, tomatoes and plenty of garlic. I thought this was pretty tasty with hits of brininess accentuated by plethora of roasted garlic. Hence, there was a robust flavour that was blessed with strong umaminess. 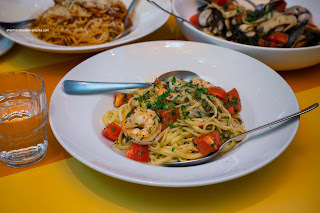 The thin pasta was still relatively al dente while the seafood was on point. We also selected one pasta from the regular menu in the Linguine Prawns Picante with capers, roma tomatoes, Calabrian chili, EVOO, lemon and fresh herbs. This was the favourite of the table since it had plenty of punch from the chilis. There was balanced combination of acidity, sweetness, saltiness and spice without going over the top. Of all the pastas, the linguine was the most al dente (even as it sat for awhile since there was no "sauce", just EVOO). The large prawns were also done right having a meaty snap and being properly seasoned. Another daily feature was the Duck, Gorgonzola and Pear Flatbread. 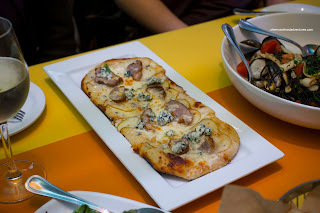 This featured a soft crust that was only a bit crispy on the edges. The wealth of ingredients on top helped soften it up. On the other hand, the generous toppings ensured there was plenty of punch too with the sharpness of the gorgonzola paired with the muted sweetness of the pear. The large slices of duck breast ranged from tender to a bit chewy. 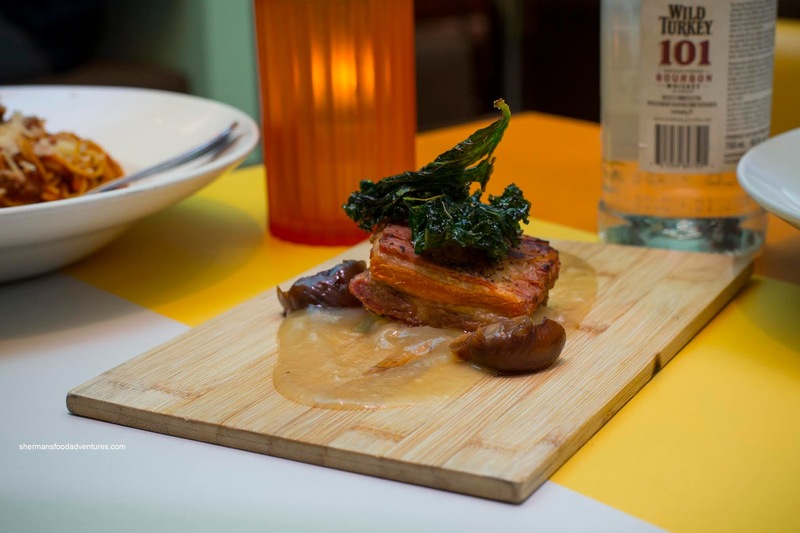 Yet another daily feature was the Pork Belly with apple puree and roasted onions. This was a pleasant with a meaty piece of roasted pork belly. The fat had been rendered enough where there was a meatiness to the pork belly that was natural-tasting with the roasted aroma really coming through. I found the apple puree to be lightly sweet but not really all that impactful. This was probably the weakest dish that we had for the meal. We also got a Caprese Salad to balance out our meal, but then I went ahead and substituted in burrata for $5.00 more. They didn't hold back as the fresh campari tomatoes were coated in a good amount of burrata. It was fresh, creamy and really made the salad. 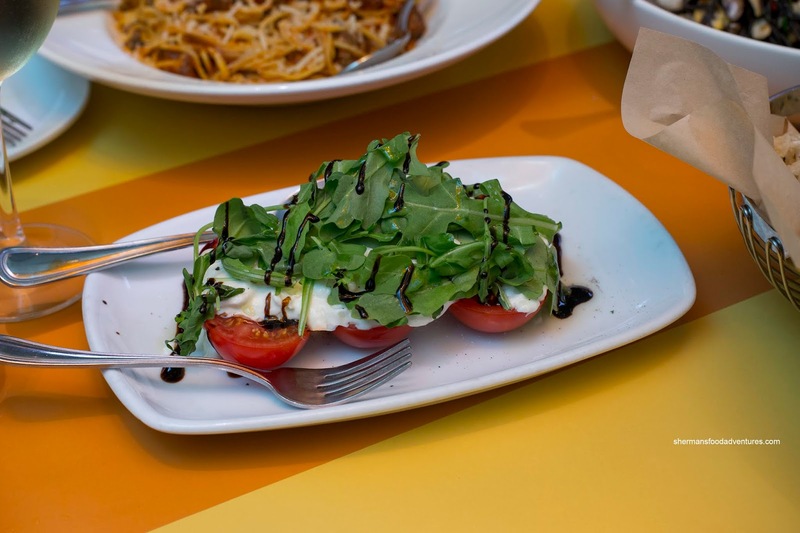 The usual fresh basil, EVOO, arugula and balsamic reduction added the classic flavours, but we wished there was more vinegar.